Though he merits only a sentence in Napoleon in America, Archduke Franz Karl of Austria loomed large in the brief life of Napoleon’s son, the Duke of Reichstadt. Born on December 17, 1802, in Vienna, Franz Karl was the 10th child of Holy Roman Emperor Francis II (Francis 1 of Austria). His mother was Francis’s second wife, Prince Maria Theresa, a member of the Naples branch of the House of Bourbon. She died when Franz Karl was four. As his parents were first cousins on both sides, Franz Karl was not particularly favoured in the intellectual department. Neither was he physically strong. He was generally regarded as rather odd and dull. When he was 11, Franz Karl’s oldest sister, Marie Louise, arrived in Vienna from Paris with her three-year-old son, Napoleon II. 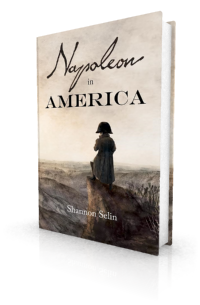 With Napoleon in exile, and Marie Louise off to become Duchess of Parma, the boy was left to be raised in his grandfather’s court. He became known as Franz and was given the title of Duke of Reichstadt. Sophie was also ambitious. She realized that her husband was not first in line to the throne. This position fell to Franz Karl’s older brother, Ferdinand. However, as Ferdinand was disabled, it was not out of the question that her husband might someday become emperor. She gradually warmed to Franz Karl, especially as he showered her with gifts of clothes and jewellery. 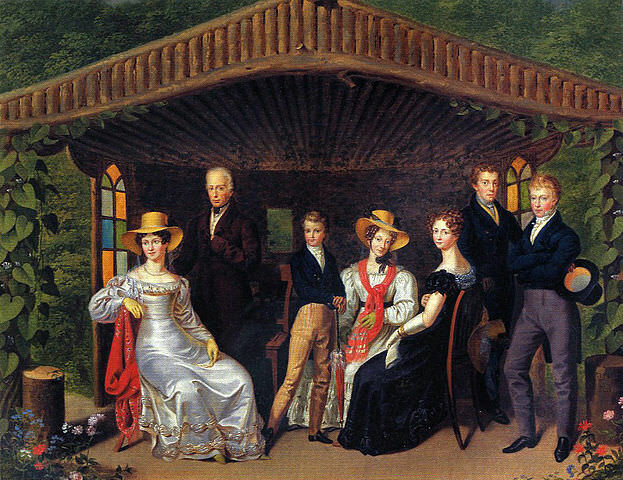 After five miscarriages during their first five years of marriage, Sophie and Franz Karl eventually had six children, four of whom lived to adulthood: Franz Joseph (b. 1830), Ferdinand Maximilian (1832), Karl Ludwig (1833) and Ludwig Viktor (1842). Both Sophie and Franz Karl kept Franz company during his final illness. Franz Karl was one of the people at his bedside when Franz died. Sophie, who had just given birth to Ferdinand Maximilian, was deeply affected by Franz’s death. Kaiserhaus by Leopold Fertbauer, 1826. From left to right: Empress Caroline Augusta; Emperor Francis I; Napoleon II of France, Duke of Reichstadt; Princess Sophie of Bavaria; Marie Louise, Duchess of Parma; Archduke Ferdinand; and Archduke Franz Karl. 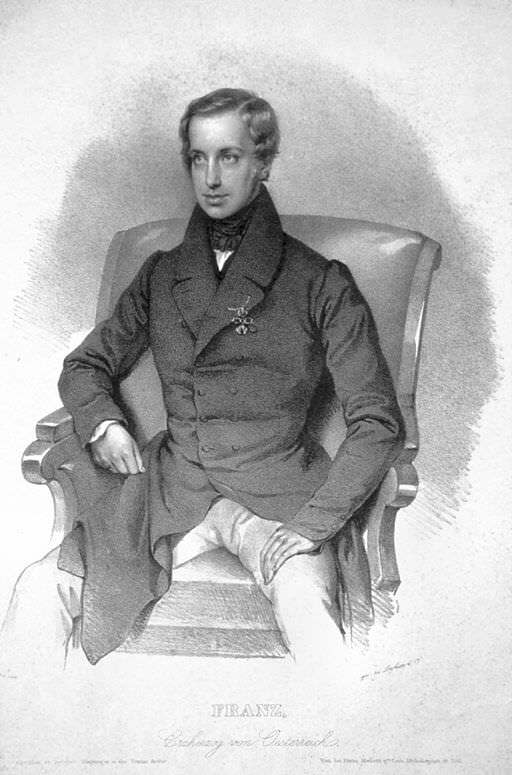 After Francis I died in March 1835, Franz Karl served as a not particularly active member of the governing council that ruled the Austrian Empire on behalf of his brother Ferdinand. In December 1848, when Ferdinand resigned, Sophie urged Franz Karl to give up his claim to the throne in favour of their eldest son, Franz Joseph. This he did, somewhat reluctantly. In 1864, their second son also became an emperor: Maximilian I of Mexico, as a result of the French conquest of that country by Napoleon III, the son of Napoleon’s brother Louis. Poor Maximilian’s reign was much shorter than that of his brother, who ruled Austria until 1916. Maximilian was executed in Mexico in 1867. Sophie died on May 28, 1872. Archduke Franz Karl died on March 8, 1878, age 75. He buried in the Imperial Crypt of the Capuchin Church in Vienna. In 1914, the assassination of their grandson, Archduke Franz Ferdinand, sparked the outbreak of World War I.
Jean de Bourgoing, Papiers Intimes et Journal du Duc de Reichstadt (Paris, 1927), p. 17. Gordon Brook-Shepherd, Royal Sunset: The Dynasties of Europe and the Great War (Garden City, 1987), p. 118. Edward de Wertheimer, The Duke of Reichstadt (London, 1906), p. 410. Richard Metternich, ed., Mémoires, Documents et Écrits Divers laissées par le Prince de Metternich, Vol. 6 (Paris, 1884), p. 61. Well, Victoria and Albert, among other royal couples, were first cousins. Were their children not intellectually gifted? I guess it would only be something called your opinion, and not fact? I don’t about Victoria’s and Albert’s children, but the Habsburgs were notably inbred and a number of Franz Karl’s contemporaries commented on his lack of intellectual gifts. Some of his siblings were even worse off. He is a good fellow and wants to do well. He asks everyone for advice, but he’s really terrible…. He would bore me to death. Every now and then I would want to hit him.